A church in Playa del Carmen, Mexico on Avenida Cinco. We took a moment to be still here, to pray for our daughter and son, for our family’s strength. We had just spoken with family who had called to give us the tragic news of our daughter and son’s devastating house fire. I offered prayers of gratitude that their lives were spared. Taking time to be still is needed to reflect and be grateful for what we have been given. 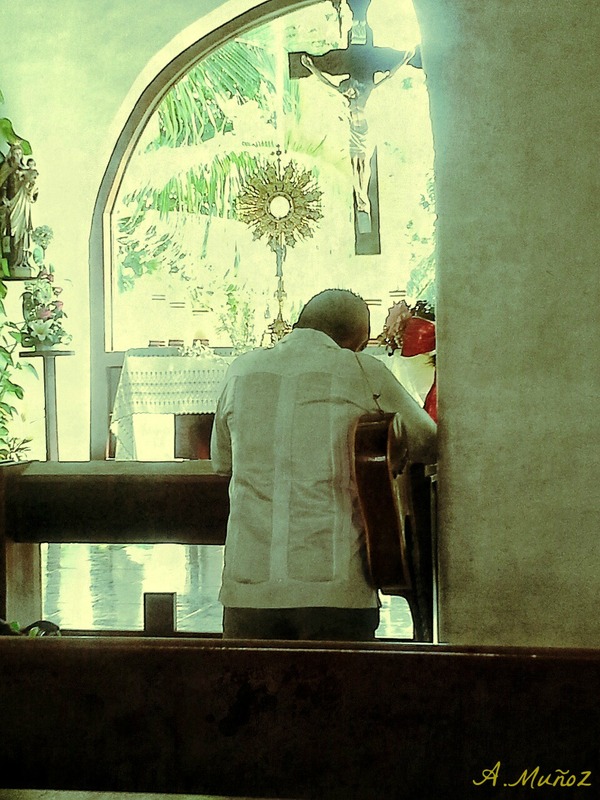 This entry was posted in Travel, Travel to Mexico and tagged churches, gratitude, Mexico, phoneography, photography, Playa del Carmen, prayer, stillness. Bookmark the permalink. So scary. But what a comfort that you could pray for them. It was scary, and to be far away from them felt so bad. I had a sense of peace in that little chapel. Thank you! Really wonderful article. I recently found your web site and also wished to declare that I’ve really adored searching your web site blogposts. After all I’m going to be signing up as part of your rss feed and i also i do hope you create yet again soon! Thanks you so much. Sorry, I did not see this comment until today. I’m so sorry to hear this unfortunate news, Angeline. I’m very happy to read that your children weren’t harmed. That is a relief. Sending thoughts and prayers to you and your family. Thanks, Jo. The scene in the little church was perfect. Oh Angeline, that is awful news!! So glad the children are unharmed. They must be happy to have you back. Sending them, and you my best wishes. Thank you so much, Madhu. The children are definitely glad we are home; this whole experience has only proven what strength there is in our family, and such a close bond and love between us all. I appreciate your thoughts and wishes. So sorry to hear about the fire Angeline 😦 It must be really hard on them. I agree one should be thankful they came out alive. Heartbreaking, Angeline. Are they able to rebuild? Is there insurance? Life can be so harsh at times. It was heartbreaking. Time slowly begins to heal. They’ve chosen to live elsewhere now. Oh, Angeline – It must have been terrifying for them (and awful for you, far away and helpless). Thank goodness they are safe and unharmed – that’s the important thing. And, armed with the love of family and friends, starting over will be a little easier. My best wishes. Thanks so much, M. The strength and love of our family has helped everyone cope with this. Thank you, Lisa. So true, once the initial shock is over, the gratitude that lives were spared takes center stage and we realize all the rest can be replaced. Fire on houses are terrible!!!! The house next to ours burned absolutelly last year, and firemen took a longtime to arrive…But if your family is ok that is the best news,,,They can always buy a new one ..The important thing is life!!! Big hug!!! Yes, we are so grateful that family is ok, and know that’s all that matters. Thanks for the hug! Precioso momento Angeline!!! Love it!!! Gracias, Ilargia. Un musico resando en la iglesia. Beautiful photograph. So sorry to hear of your daughter and son’s loss. It must be devastating for them. I hope this is one of those times that brings a silver lining in some form, otherwise it must be really hard to deal with. Sending prayers for all of you. Thank you, Alison. I know there is a silver lining out there. We are grateful that our children are safe. Thank you for your prayers; I believe in their power. Thank you, Professor. This means a lot to me.